A Tibetan monk, namely Lobsang Thupten, held a peaceful solo protest in Ngawa, Sichuan, on Monday 2 May 2016. He was showing his discontent towards the Chinese Government’s policies by holding a portrait of the Tibetan spiritual leader, the Dalai Lama. Mr Thupten was shortly arrested and imprisoned by the local traffic police. This proves the difficulty for individuals living in China to exercise their basic right to freedom of expression. The below article was published by the Tibetan Centre for Human Rights and Democracy. 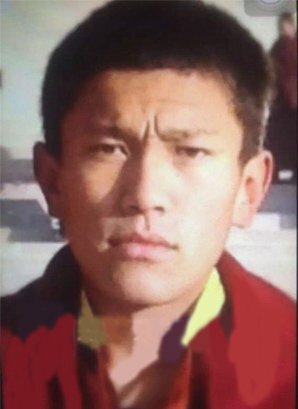 A Tibetan monk from the local Kirti Monastery who staged a peaceful solo protest against Chinese government policies was detained in Ngaba (Ch: Aba) County in Ngaba Tibetan and Qiang Autonomous Prefecture, Sichuan Province, the Tibetan province of Amdo. The monk Lobsang Thupten staged the protest holding a portrait of the Tibetan spiritual leader His Holiness the Dalai Lama on the main street of Ngaba County town at around 3 pm local time on 2 May 2016. He was detained immediately by the local traffic police. TCHRD is unable to immediately confirm his current condition and whereabouts. Two short video clips and a few photos of his solo protest have been circulated over social networking sites. In one of the videos, Lobsang Thupten is seen holding a portrait of the Dalai Lama, coming out of a white building and walking along the main street. However, the exact slogans he shouted remain unknown. In the second video, two traffic police are seen detaining the monk. This video also shows passers-by on both sides of the main street stopping by and watching the monk being detained. Generally, Chinese law does not allow traffic police to detain a person when the incident has nothing to do with traffic violation issues. Further, if the traffic police transgress their duties and detain people, the victim and the general public can appeal to the court and other legal organizations. In this case, the Chinese traffic police have clearly crossed the legal boundary by arbitrarily detaining Lobsang Thupten who was simply exercising his basic right to freedom of expression non-violently. Further details on Lobsang Thupten such as his age is not available. He hails from village no.1 of Meuruma (Ch:Maierma ) Township in Ngaba County. In the past years, Ngaba County town has witnessed an increasing number of peaceful solo protesters, majority of whom belonged to the largely nomadic town of Meurum.